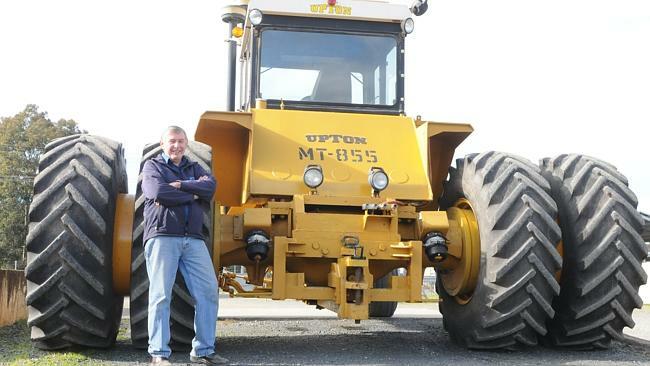 LOVERS of Upton ­Engineering tractors are extraordinarily pas­s­ionate about them. The last one was built 34 years ago and owners are reluctant to sell. When Corowa manufacturer Upton Engineering was scouting for a heavy-duty tractor for yard work recently, it was able to buy a rare two-wheel-drive with its own name already on the side. It was an Upton MT-855, one of about eight of this model built in the mid-1970s. Paul Upton, a third generation Upton, who manages the business with his brother, Marc, said they needed a good tractor to help pull sleds loaded with centre- pivot irrigators from shipping containers. Their father, Carl, who has retired from the business, ­designed the Upton 2WD tractors in the 1960s and 1970s after the business developed a reputation for retrofitting former US Army World War II tanks as landclearing and water pumping machines for farmers and irrigators along the Murray River. Upton Engineering was started by Carl’s father, Arthur, in the 1940s. The supply of second-hand diesel ­engines and heavy differentials from the Grant M3 tanks eventually dried up, and Upton Engineering began building bespoke tractors to order. Only about 30 tractors were built over a 12-year period from the late 1960s. Most of the Upton tractors were designated “MT”, for med­ium tractor, although when they were built they were the biggest 2WD agricultural tractors in the world. Paul said because they were only ever built to order with long lead times, the sales volume was never going to compete with the 4WD off-the-shelf tractors delivered by overseas manufacturers. The MT-855 recently bought by the Uptons was built in 1976 and acquired from a farmer at Minlaton, on the South Australian Yorke Peninsula. The purchase has a story to it. Paul found the owner and had to convince him they were worthy to buy the much-loved piece of machinery. The farmer, Scott Hoyle, drove all the way from South Australia with an armful of photo albums of his beloved MT-855 to visit the Uptons at Corowa. “He left the photo albums with us and said we could have the tractor and he delivered it to us,” Paul said. “Scott told us he knew he needed to sell the tractor but he wanted it to go to the right owner. The MT-855 has a 216kW (290hp) Cummins diesel ­engine and, according to Paul, makes passersby take notice when they fire it up. It is a cherished addition to the Upton Engineering yard and will be used to move sleds of parts now that Uptons has become the national distributor for Pierce Centre Pivots. Carl, who retired about 10 years ago, is quietly pleased his old tractor is back “home” but still on the lookout for another, the biggest factory built 2WD tractor in the world. At 23 tonnes and with 350hp, this is one big tractor and was last seen still at work in South Australia. Carl would love to know its whereabouts and would possibly be interested in buying it. While Upton Engineering is busy building everything from racetrack watering systems to fog cannons to damp down dusty digging areas in the mines, you get the feeling Carl would still love to be building tractors, and 2WD ones at that. 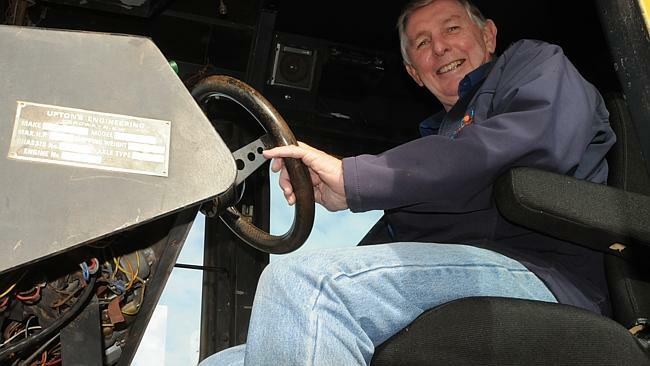 “We built tractors in country Australia in Corowa and we took on the world,” he said. He maintains 2WD tractors suit many Australian conditions better than 4WD, which he considers a waste especially in the Riverina. But he acknowledges the prestige of owning an imported tractor, and the finance deals offered through the major manufacturers, mean Upton tractors can’t compete. Upton Engineering, which marks its 70th anniversary this year, still makes its own design irrigation equipment and sells imported centre pivot systems for broadacre growers. A giant yellow MT-855 in the yard will not only be a big help but a constant reminder of the day they took on the big guys.